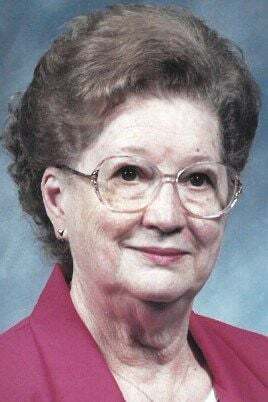 Gloria M. Lauer, 88, of Chippewa Falls died Wednesday, Feb. 6, 2019, at her residence. Gloria was born March 27, 1930, in Sherwood, Wis., the daughter of Albert and Elvira (Dexheimer) Hopfensperger. On Oct. 28, 1950, Gloria married Harold Lauer in Holland, Wis. She was a member of Notre Dame Church. Gloria enjoyed traveling, reading and doing crossword puzzles. Gloria is survived by her husband, Harold; one son, Steven (Debbie) Lauer of Eau Claire; one daughter, Phyllis Lauer of Wheaton, Ill.; two grandchildren, Michael (Molly) Lauer and Amy (Adam) Potaczek; and three great-grandchildren, Gunnar and Gage Potaczek and Rory Lauer. Gloria was preceded in death by her parents. Funeral services will be held at 11 a.m. Saturday, Feb. 9, at Notre Dame Church in Chippewa Falls. The Rev. Jesse Burish will be celebrant of the funeral Mass. Entombment will be in Hope Mausoleum in Chippewa Falls. Friends may call from 10 a.m. until the time of services at 11 a.m. Saturday, Feb. 9, at Notre Dame Church. Gloria’s family would like to extend a special thank you to St. Joseph’s Hospice for the excellent care they gave her and to the staff at Wissota Place. Gloria will always be remembered for her positivity, generosity and kindness.